Welcome to Chilly Dogs Sled Dog Trips! Located near Ely, Minnesota, a special little town known far and wide as the Gateway to the Boundary Waters Canoe Area Wilderness in the Superior National Forest, we provide exciting dog sledding adventures to individuals, families, and groups of all kinds. Our knowledgeable, seasoned guides accompany you as you drive your team of eager, friendly, sled dogs over scenic wilderness trails. That, combined with our thorough trip preparation, top-notch equipment, comfortable facilities, and convenient proximity to Ely, makes a Chilly Dogs Sled Dog Trip the perfect winter activity. You'll have the time of your life as you pass through the picturesque North Country with a team of hearty Alaskan Husky sled dogs out in front of you, having as much fun as you are! They love people, and they love to run and pull—it's what they were born to do! Every trip is unique; the opportunities for adventure are endless. Whether you're riding in the padded sled enclosure, or standing on the back runners driving the team (and on this trip, you get to do both! ), you'll see that dog sledding is not only fun, it's un-fur-gettable! Far from the normal hustle and bustle of ordinary, everyday life, an experience like this becomes that spark of inspiration that pops up in your memory again and again. ...now I can check this off my Bucket List! There's a reason that many of our guests have called their Chilly Dogs experience "...the trip of a lifetime." Others have told us that now they can cross this adventure off their "Bucket List". No matter what motivates you, we are here to provide the means for you to accomplish your goals. Give us a call at 218-365-4726, or contact us below today. We are happy to make your dreams of dog sledding come true! 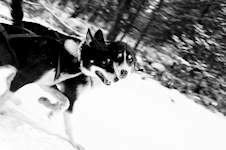 Providing exciting dog sledding adventures to individuals, families, and groups of all kinds, with thorough trip preparation, top-notch equipment, comfortable facilities, and convenient proximity to Ely, Minnesota. This was so much fun. Great people. One of the best days of my life. Don't be scared because you don't know how to dogsled. You'll learn and it isn't overwhelming. I can't wait to go again. We had an awesome time at Chilly Dogs! Donna, Jeff and family are wonderful and made us feel so welcome. The ride was great fun and we also enjoyed the "meet and greet" with the dogs. We have a new appreciation for the sport and for these amazing dogs - so talented and they love what they do immensely! We highly recommend Chilly Dogs. We most definitely will be going back for another trip next winter! I had a really great experience with chilly dogs! Already when I called them to get some more information I recognize their great and hearty service and engagement. My english is not the best, so sometimes it's kind of hard for me to talk to people on the phone but they were really patient and friendly to explain me every small single thing i wanted to know. What I really really like was the whole atmosphere at this kennel. It's a family business and they all are into dogsledding and do everything that you have a good time there. They also took their time before and after the trail for a nice talk and to answer all our curious question. You can see that they love their job and their dogs. We booked the Backcountry Loop trip (only because the Snowly Owl Run was full) and we all had a blast! Here's what we liked: the family that runs it treats you like you're special and that they're happy to have you (we were met by the owner as we got out of our cars! ); it's evident that safety is a primary concern; the route is through northwoods trails (not simply out on a lake); there's an appropriate challenge to it - you have to listen and know what you're doing - you have some control over your driving - it was exhilarating without being scary. Take their great advice and rent clothing you don't have - it made a HUGE difference to our comfort on a cold day. I never felt cold at all because I was dressed correctly. Highly recommend! So we are a little late in our review but better late than never. We visited Chilly Dog in January of this year with our two children, 9 and 11. All I can say is WOW, what a memorable experience. They were professional, patient, and so warm and friendly. I can't say enough about our experience. You can't go to Minnesota in the winter and not go to Chilly Dog. You won't regret the drive to Ely and the time spent there. It is worth every penny and then some. As a family from Florida this was a once in a lifetime experience for us and we often said that if we ever make a trip back, Chilly Dog is sure to be on our agenda of things to do! Chilly Dogs is a excellent family run business that offers nothing but the very best for their customers. From the moment you pull into their beautiful property until the time you leave you are surrounded by warm smiles and wagging tails. The owners are courteous and the dogs well taken care of. The entire sledding experience is something I will not soon forget. I have been on many trips in many different countries, but this get away has to be one of the very best! I cannot put into words how professional and courteous the owners are, and just how exciting the teams of dogs were. It was simply amazing! Our dog sledding trip was great. It was 17 below that morning but the dogs seemed to love it. The trail was beautiful and it was fun to watch the dogs work. It's not as intense as you might think, so I would recommend it to families for sure. The family who runs it is great and most importantly they really seem to love the dogs and what they do. Awesome experience for the family. Our girls (ages 10 and 5) loved every minute. They were very excited the weeks leading up to the trip and the experience exceeded their expectations. Very knowledgeable and professionally run enterprise that made us feel right at home. The temps were below zero but everyone stayed warm the entire time. An incredible time for the whole family. The trail was amazing and so peaceful. The girls are already planning our next trip. Our experience at Chilly Dogs this Christmas past was outstanding. You were professional and welcoming in all ways. What a wonderful adventure for all our children, which we hope to repeat soon. Thank you, and all the best for the new year!